Made from sugar cane. 96% bio-based plastic. 95% recycled CO2. 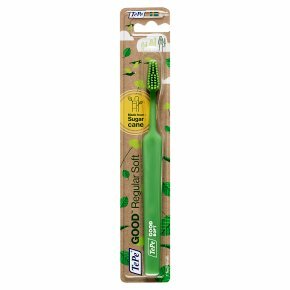 The Good side This toothbrush is part of a TePe initiative to make a difference. For the good of the planet and for your good. From Good sources 100% bio-based filaments and a handle made from 96% sugar cane-good, renewable raw materials. From Good energy Produced using 100% green energy, partly from our own roof-top solar panel facility. For Good results Recirculates 95% of CO2 emissions during its life cycle. Good for your teeth - good for the environment. Toothbrush with a tapered brush head for easy reach. Soft. end-rounded filaments for gently and efficient cleaning.